Alaska Airlines is celebrating its new partnership with the Portland Timbers by running a "Paint the Plane" contest that allows fans an opportunity to have a say in the design of the team's branded plane. 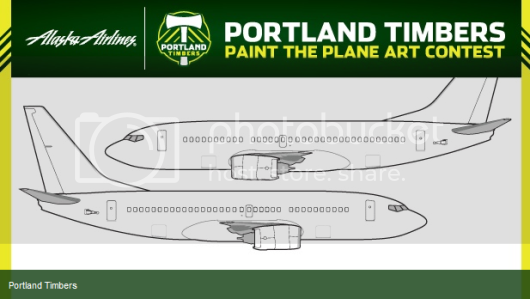 From February 1st through February 15th, fans can submit their own, unique Timbers centric airplane designs using a PDF template of a 737 Alaska Airlines plane that is available to be downloaded on the Timbers' official website. Fans can submit their artwork either by email or by mail, per directions on the website. Each of the submissions will be judged based on originality, creativity, and team personification, with the Grand Prize Winner receiving two (2) complimentary first class roundtrip tickets to anywhere that Alaska Airlines flies, two (2) club seats to the Timbers' inaugural home game, and a team autographed jersey... in addition to seeing their sketch design brought to life on an actual Alaska Airlines aircraft. In addition, Alaska Airlines is also awarding 2nd Place, 3rd Place, and (7) Honorable Mention prizes for additional noteworthy submissions. The promotion serves as a great way for organizations to leverage airline partnerships, especially in a day and age where airlines are investing more dollars and demonstrating a willingness to brand aircraft. Look for more organizations and their airline sponsors to enact similar initiatives in the near future!